This ESP8266 Programming tutorial describes how to use integrate ESP8266 and Android using voice commands. 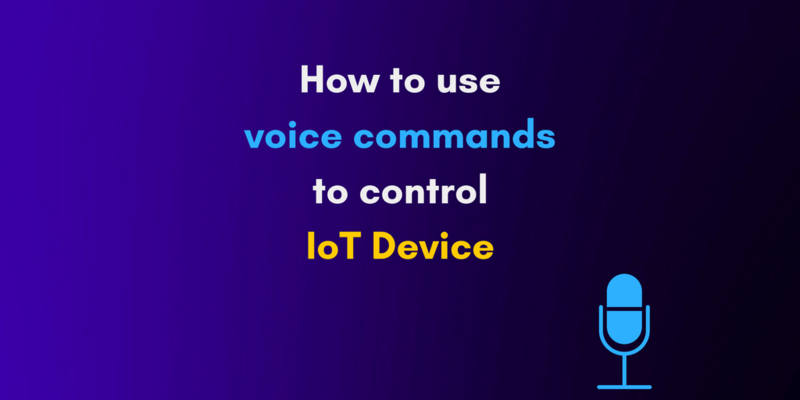 In other words, in this article, we will use our voice to send a set of commands to an IoT device. During this post, we will build a voice-activated IoT project using ESP8266 and Android. This is an interesting topic because this project uses a different way to interact with IoT device. Usually, we are used to interacting with a device using a simple user interface exposed by the device or a using a smartphone app that sends commands to the device. The Android app takes care to interact with the user and listens to the voice commands. Next, the app translates the voice commands into commands that the IoT device can understand. 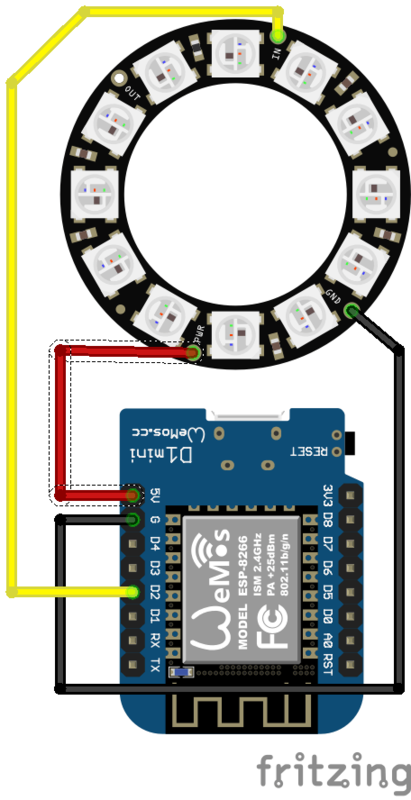 In this article, as IoT device, we will use an ESP8266 WeMos that controls a NeoPixel Ring. You can use an Arduino Uno instead of the ESP or a MKR1000. There are other several projects that we can build using ESP8266, you can discover how to send IoT notification using ESP8266. In the method above, the app extracts the command and according to it invoke the ESP8266 to set the ring LEDs color. 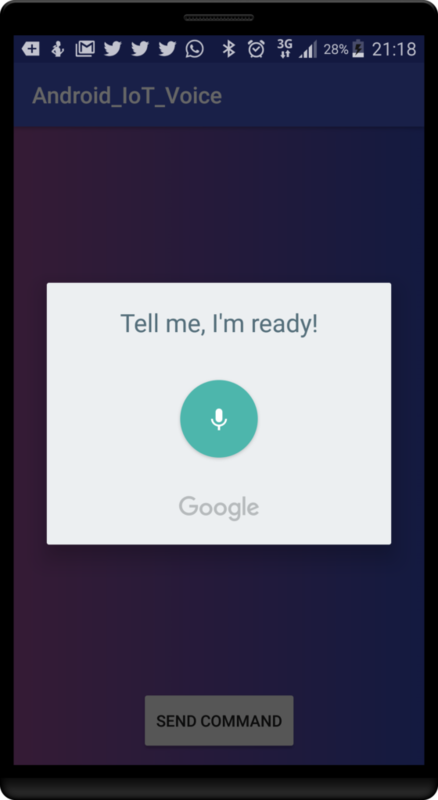 In this example, the Android IoT voice app handles simple commands like Red, Green, Blue and so on. 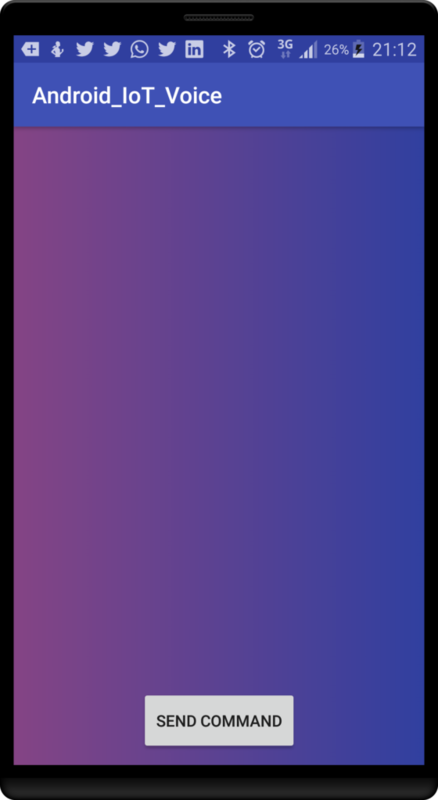 If you are new to Android and want to have more information you can read this tutorial describing how to develop an Android app using material design. In this step of this ESP8266 programming project, we implement the network communication between Android and ESP8266. By now, we can suppose that the ESP8266 exposes a method invoked by the Android app to set the ring colors. In this context, we can suppose that the ESP8266 exposes a RESTful API. In order to invoke this API, the Android app uses an HTTP connection. It is very simple and it uses OkHTTP library. Notice that the data parameter holds the color hex code retrieved from the voice command. The next part is implementing the IoT side of the project that receives the color hex code using the API exposed by the device and set the LEDs color. The first one is used to control the LEDs ring while the second library is necessary to expose some functions in the sketch as API. If you are new to this library, you can read my previous post describing how to expose Arduino functions as API. In details, at the beginning, the sketch tries to connect to the WiFi network. To this purpose, you have to provide the WiFi ssid and the password. Once the connection is established, the sketch configures the server and its port. Moreover, it declares the function we want to export as API. The last part is the method used to control the Neopixel ring. At the end of this ESP8266 Programming tutorial, you know how to use voice to control an IoT device integrating ESP8266 and Android app. In more details, you have explored how to connect and Android app with an ESP8266 and how to use voice to interact with it.